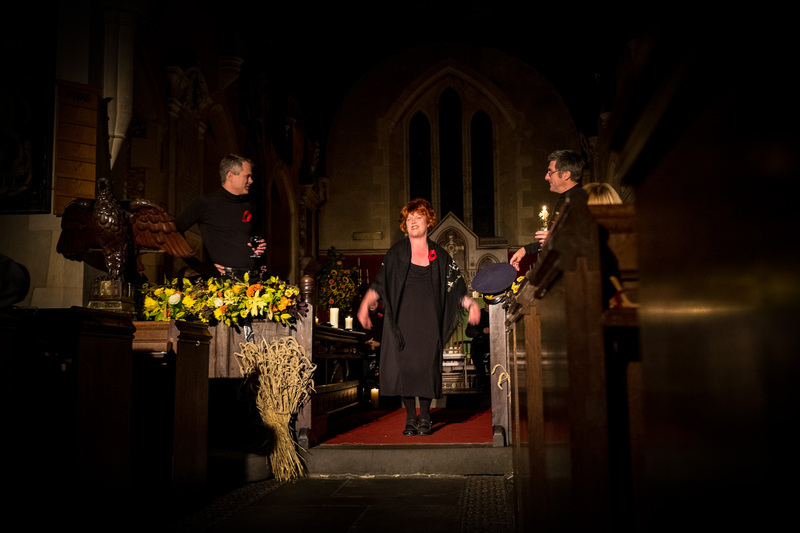 Rev’d Maria Shepherdson memorably re-created the scene in the film “Oh What A Lovely War” where a French singer first imitates Charlie Chaplin and then switches moods completely to sing “Adieu La Vie”. 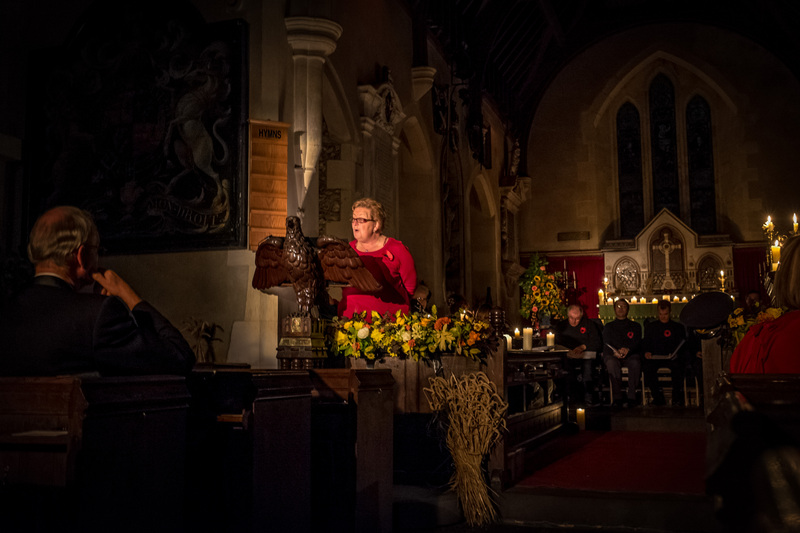 Other singers and readers performed equally memorably – Christine Lawrence, Jo McCombe, Mark Miller, Nick Moakes, Jenni Moseling, Jane O’Neill, Rod Palfrey, Phil Shepherdson and Paul Thomas. 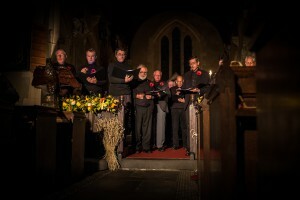 The supporting chorus were Gill Gibson-Pigott, Marilyn Martin, Peter Dodds, Geoffrey Gibson-Pigott, Martin Moseling and John O’Neill. Steve Cutler gathered and performed the music so well, Mark Cooper delivered his subtle lighting effects and Liz Moakes created the programme and publicity. As they were driven into Sarajevo, six Bosnian Serb nationalist assassins were waiting. The first lost his nerve, the next threw a bomb which bounced off the folded hood of the Archduke’s open limousine and exploded under one of the following cars in the cavalcade. Nobody was seriously hurt, although a fragment from the bomb stung Sophie’s neck. Three more would-be assassins melted away into the crowd, leaving only 19 years old Gavrilo Princip. 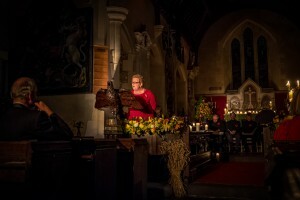 The cavalcade went on to the Town Hall, as planned, where abandoning the visit was discussed. Bravely, the Austrian couple decided to continue, but their worried host insisted on standing on their limousine’s running board as a bodyguard. Nobody is sure whether the original route had been altered but there was now a fatal mistake. The chauffeur turned right, as per his original instructions, towards a museum. Ordered to stop and reverse, he did so, driving slowly alongside where Princip was standing. Princip had failed to get off a shot a few moments before, but now he couldn’t miss. Two shots left the Archduke and his Duchess mortally wounded. Eerily, their car bore the number plate ‘A111118’ – the date of the Armistice more than four years later. Baldrick’s explanation of how war came: “I heard that it started because a bloke called Archie Duke shot an ostrich ‘coz he was hungry.” Not quite right. 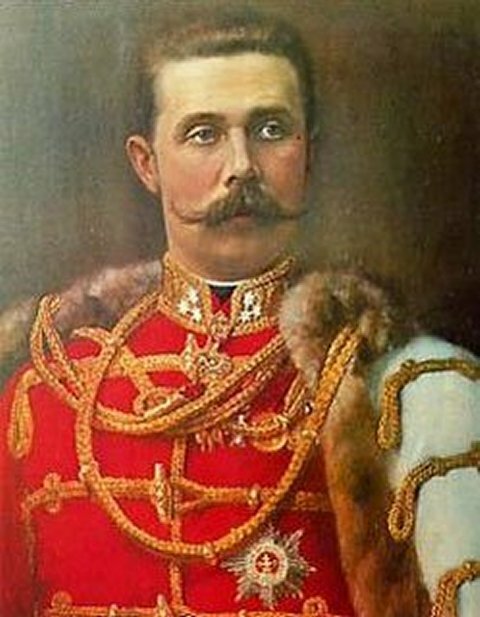 Austria-Hungary, with blank cheque backing from Germany, blamed the assassination on Serbia (part of the Ottoman Empire until 1878), and presented the Serbs with an intentionally unacceptable ultimatum in order to provoke war. As expected, Serbia accepted only 8 of its 10 terms, so on 28 July Austria-Hungary declared war on Serbia, triggering a cascade effect across Europe. Russia, bound by treaty to Serbia, declared war on Austria-Hungary. Germany declared war on Russia, and France declared war on Germany. Kaiser Wilhelm had undoubted psychological problems, perhaps caused by his embarrassment about his withered left arm. He liked to talk tough: “I look upon the People and the Nation handed on to me as a responsibility conferred upon me by God, and I believe, as it is written in the Bible, that it is my duty to increase this heritage for which one day I shall be called upon to give an account. Whoever tries to interfere with my task I shall crush”. But until this crisis he had backed away from military action so often that his officers referred to him as Wilhelm the Timid. This time he didn’t back off. Immediately after France declared war on Germany, the German army crossed into Belgium – whose neutrality Britain had sworn to defend back in 1839 – in order to reach Paris. From the end of 1914, two lines of opposing trenches stretched some 450 miles from the Belgian coast at Nieuwpoort to the Swiss border. The Belgians covered 15 miles, the British 123 miles (27% of the total length), and until 1918 when the Americans took over 80 miles in the south, the French covered all the rest. Because the Germans dug in first, they seized the high ground. This not only gave them a tactical advantage, it also kept them much drier than the British and French, who were forced to dig in areas that were typically only 2 to 3 feet above sea level. This led to frequent flooding. The British and French saw their trenches as temporary: they intended to drive the Germans out as quickly as possible. The Germans, happy to squat in French territory until the exhausted Allies negotiated peace, built much more solid trenches. German dugouts were typically 12 feet or more in depth, and were sometimes constructed three stories down, complete with concrete stairs. German dugouts also typically had electricity, as well as toilets. The gap between the two front lines varied from 50 yards to half a mile. A British front line was deep, lightly manned and protected by belts of barbed wire and parapets of sandbags. 100 yards behind lay the support trench line, where men spent most time. There the officers lived in dugouts, often with their gramophones. Their men survived mostly in funk holes cut into the trench side. A further 300 yards back was the reserve trench line. Communications trenches linked these lines. Trenches were built in a zigzag pattern so that, if an enemy invaded a trench, he couldn’t fire along its entire length. This pattern also provided some buffer if a shell exploded in a trench. Periscopes or armoured viewing plates among the sandbags allowed a view reasonably safe from snipers. 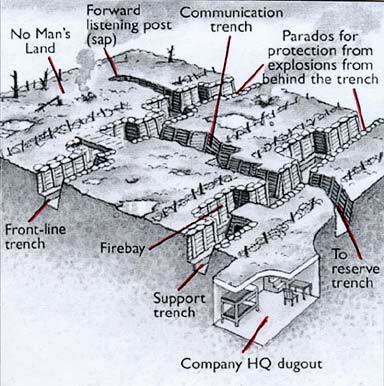 This cross-section of a front-line trench shows how Fire-steps built into the sides allowed soldiers position themselves with their rifles at the ready when on sentry duty or when an enemy attack was anticipated. Trench days started and ended with “stand–to”, with fixed bayonets in the front line. Once stood down, there was food of a sort – sandbag duff, which was stodge cooked in sandbags; cold bully beef; Maconochie’s stew; and bacon. Tea was served from empty fuel cans, and tasted like that. Everyone benefitted from a fast postal service with food and clothing from home. Rum was served at dawn and dusk on the front line, prior to going over the top and recce patrols, and at burials. Officers had more leave – with a dawn pass, they could enjoy Chu Chin Chow in London the same evening. In quiet times of day, apart from keeping watch and ducking snipers and shelling, the men repaired trenches, drained flooded ones, emptied latrines, wrote letters and cleaned their rifles – some troops even found time to enter vegetable growing contests.. The British were keen on tunnelling and digging saps (probing trenches) under and across No Man’s Land. They were also keen on mining operations to place high explosives beneath the enemy’s fortifications. At Messines Ridge the British dug 22 such mines of which 19 containing 600 tons of high-explosive were successfully fired on 7 June, 1917 killing some 10,000 Germans. An offensive spirit was encouraged at night – crawling out into No Man’s Land to listen to the Germans, to mend or lay barbed wire, or even raid a German trench and bring back prisoners in order to identify the opposition. Robert Graves once found his opposition commanded by Crown Prince Rupert of Bavaria, heir to the Jacobite claim to the British throne. Trench experience was sometimes hellish, but not on all sectors or all the time. 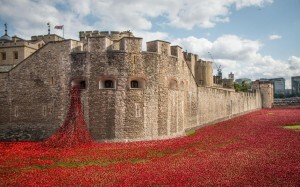 A high proportion of the troops never served in the front line. Boredom was more likely than terror. A typical infantry soldier was only in the front line trenches for about one quarter of his total time overseas and involved in action for just a few days in the whole war. A soldier didn’t spend all of his time in any given trench. A typical British soldier spent 15% of his year on the front line, 10% on the support line, 30% on the reserve line, and the rest of his time on rest, on leave, or in hospital. The disastrous first day on the Somme wasn’t the norm. The Somme sector was relatively quiet in 1915 and 1917 and launched the advance to victory in 1918. Even Ypres, more truly hellish in its last ‘Passchendaele’ phase in autumn 1917 had calmer periods. By comparison, it has been suggested that fighting in World War II in truly awful conditions in Burma, with its terrible terrain and climate, and the extra ingredients of disease, extreme hardships and lack of comforts against an enemy who ignored humanitarian laws, was even worse. The first day of the Battle of the Somme proved to be the British Army’s worst day with nearly 60,000 casualties, almost 20,000 of whom were dead. British generals felt that their New Army still wasn’t battle ready but the French, their senior partners, demanded an attack to divert Germans from the attritional battle at Verdun which had started in February. For five days, Allied guns bombarded the German defences – their roar distantly heard in London. Convinced that the German wire had been smashed and the Germans pulverised, British generals told their troops, many in their first battle, to keep together and walk over. But the shells had failed to cut the wire – the wrong type of shells had been supplied. The Germans, safe in their deep dugouts, simply waited for the barrage to end, then dashed to their parapets to machine gun the slowly advancing British. Some divisions did achieve their objectives with minimal casualties but overall the full frontal attacks proved disastrous. The Army learned in the worst possible way that creating battalions from a single locality, such as the Accrington Pals, severely damaged civilian morale when losses were such that local newspapers were black with casualty notices. Second World War generals, like Montgomery, who had experienced the First World War were very much more careful to minimise casualties. The Battle of the Somme went on until November. The British did learn lessons. Commanders who had insisted that a company (120 men) was the smallest unit of manoeuvre were soon persuaded that a section of 10 men would be so. The British introduced their first tanks, took further the use of mines, experimented with a creeping barrage which placed a curtain of artillery fire just ahead of advancing infantry, and began to develop the combined use of artillery, infantry, tanks and aircraft which would win the last great battles of the war. There was a recovery from this disaster. By the end of the Somme campaign in November, latest estimates say that the Germans had lost 650,000 men killed or wounded, as against 420,000 British and 202,000 French. 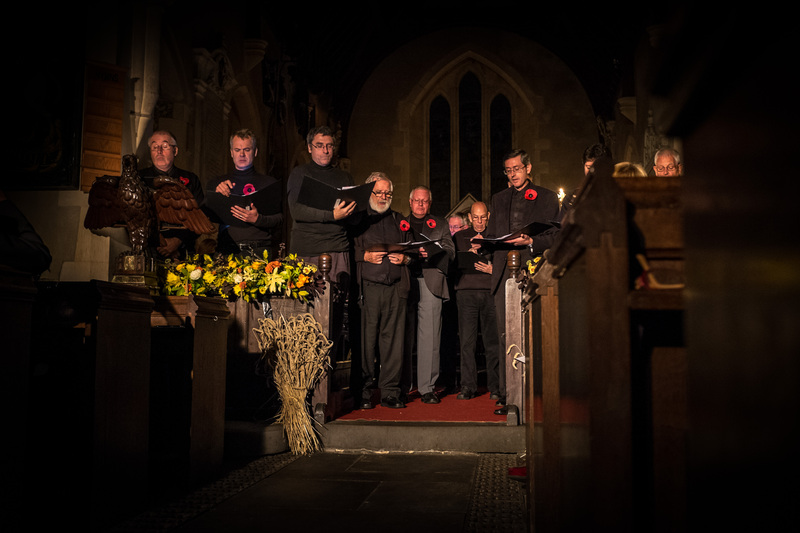 The Battle of the Somme marks the mid-point of the war and a complete change of mood. Haig was no military genius but he was an outstanding product of the British military system and at least as able as most other national commanders. He also had to cope with severe political and strategic difficulties, serving a government which did not afford him anywhere near full support. In reality Haig has often been made a scapegoat for critics who want to pillory someone (but seldom the Prime Minister) for the very heavy losses. Tellingly, it was his men who insisted after the war that a memorial should be erected to him. In 1914 we produced only 35% of our food – imports provided 50% of our requirements. The Germans accordingly began a blockade in 1915 to starve us. Our Board of Agriculture responded by creating the Women’s Land Army. By 1917 over 250,000 women were farm labourers. Nevertheless Britain was so near starvation that year that fighting troops were drafted back to the UK to help with the harvest. But that harvest failed, Britain came down to just three weeks’ food reserves, and food rationing was introduced. The Royal Navy played a crucial role in guarding the merchant ships bringing food to Britain, latterly in convoys (an idea which we initially forgot in the Second World War). But the Navy also conducted its own naval blockade of Germany which restricted the maritime supply of raw materials and foodstuffs and was a key element in our eventual victory. Staples such as grain, potatoes, meat and dairy products were so scarce by the end of 1916 that ‘ersatz’ products such as Kriegsbrot (“war bread”) and powdered milk were introduced. Food shortages caused looting and riots. In 1918 the German Board of Public Health estimated that 763,000 German civilians had died from starvation and disease caused by the blockade. The blockade also contributed to revolutionary uprisings in Germany and the collapse of the Kaiser′s administration. Free of invasion fears since Napoleon, the British were shocked to find their homes in range of raids by sea and hence perhaps of invasion. On 16 December, 1914, the Germany Navy bombarded Scarborough, Whitby and Hartlepool, killing 122 people. News that the Germans were using airships to drop bombs on civilians in Belgium added to public concern. 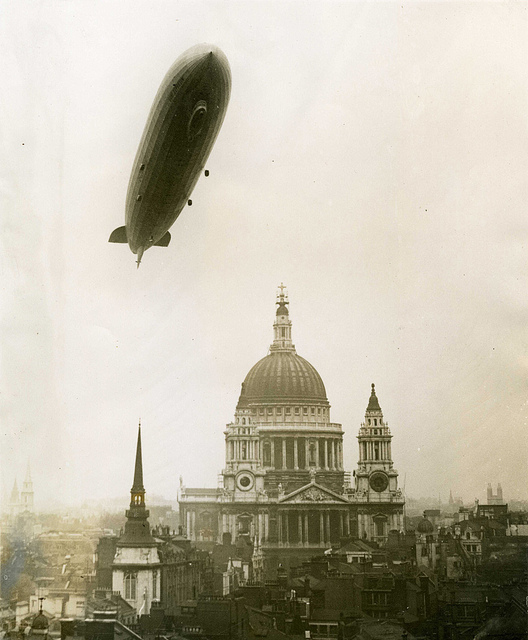 Airship bombing raids on Britain began in 1915, mostly using Zeppelins. Over 1,900 people were injured during the 51 airship raids, including 557 killed. The 27 aircraft raids, starting in 1917 and mostly using the big Gotha aircraft, were more deadly: over 2,800 casualties including 835 killed. The Germans calling a bomber the Gotha stung George V. In July, 1917, he renounced all German titles and formal associations with the House of Saxe-Coburg-Gotha, i.e. the family name which came with Prince Albert. He renamed his dynasty the House of Windsor. In January, 1917 the Germans decided to use unrestricted submarine warfare to increase the effectiveness of their blockade of supplies coming from the United States to Britain. This brought the reluctant Americans into the war but no American troops reached the Western Front until October. For a while it seemed that they might not be needed. British church bells rang in November to celebrate our first so-called victory at Cambrai, where 476 tanks were used – but the Germans soon recaptured their lost ground. But the coming of the first Americans persuaded the Germans into open warfare. The German offensive in spring 1918 was so successful that in April Haig instructed his troops: “With our backs to the wall, and believing in the justice of our cause, each one of us must fight on to the end”. But the Germans couldn’t reinforce their advance and their offensive petered out. They were too weak to resist a surprise allied counteroffensive. By the end of 8th August, the first day of that offensive, the British army had punched a hole 15 miles wide in the German front. Ludendorff, the German commander, called this the blackest day for the German Army in the war and advised the Kaiser that the war was lost. American involvement in the final offensive started in late September and proved costly. They didn’t heed British warnings and attacked in frontal assaults. The result: the largest American cemetery in France – not the one at Omaha, but the one at Meuse-Argonne. Meanwhile the British and French drove the Germans backwards; their Hindenburg line defences collapsed; the Kaiser abdicated and Germany capitulated. It was by far the greatest victory in our history. Because there was no fighting on their soil, Germans later laboured under the delusion that their army hadn’t been defeated. This delusion fuelled their disgust with the peace settlement (whose terms they largely ignored anyway) and helped the rise of Hitler. By the time of the Armistice, the world was suffering the so-called Spanish ‘flu’ pandemic, thought to have spread out from infected Chinese labourers in Etaples, a British Army base in France. 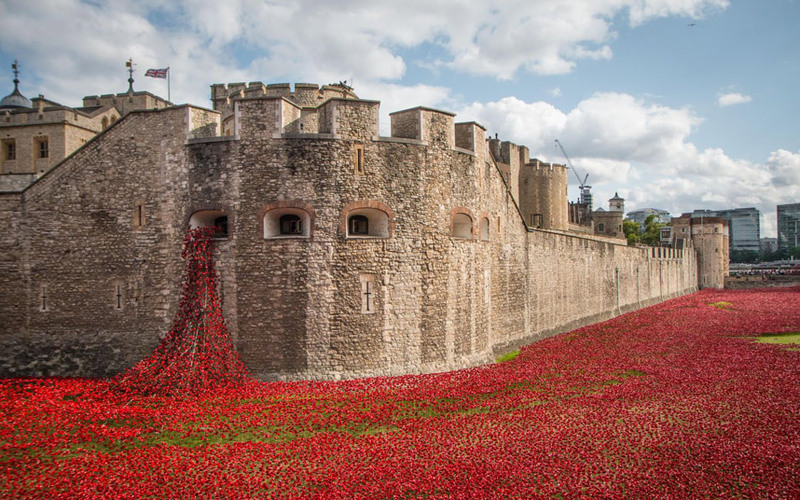 Worldwide the First World War cost 37 million casualties – military and civilians – of whom some 16 million people were dead. But that figure includes the first deaths from the deadly ‘flu which raged from January 1918 to December 1920. That killed minimally 50 million, may be up to 100 million people, dwarfing the deaths through military action. Three million women served in Britain’s cause during the First World War, of whom 1,404 died, the largest groups being 798 nurses and 237 munitions workers killed. 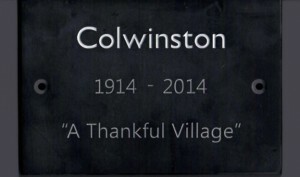 ‘Thankful Village’ was a term coined in the 1930s by the writer Arthur Mee for a village in which all the men who had left to serve in the Great War returned safely. 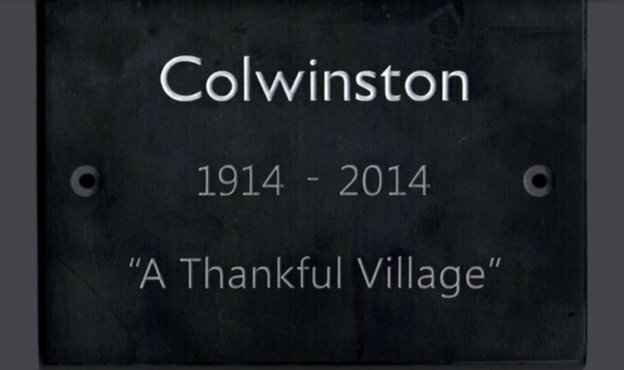 There are estimated to be 53 such villages in England and Wales, but none in Scotland or Northern Ireland. Of this number, 13 are ‘Doubly Thankful’, ie they also lost no service personnel during World War II.